The Daily Digress: Tagged by Blog O' Beth. Tagged by Blog O' Beth. And I like the Blog O' Beth and she provided a nifty little graphic, so I'm going to do it. I predict The Tank will learn to use the potty by March, no matter what he says. "I said nooooo, thanks!" "I can't like dat potty." "I don't care my potty." "Dat potty's not for me." Lies. All lies. I predict these artists, The Half and Half, will become wildly successful. 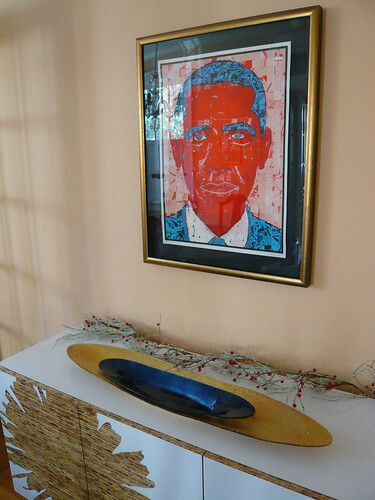 Your political views notwithstanding, I love the print below, which we bought a few months ago and my husband had framed as a Christmas gift to our family. Barack Obama will be the first political candidate my two oldest children remember supporting and, in case you hadn't heard, he is our first non-white president. About damn time. I predict my marriage will get fun again. Seasoned parents, we've finally realized we don't get along with a toddler in the house. In fact, if we ever do this again, I will suggest separating and sharing custody from the time the toddler is one and a half until he acts like a human, around three. Then we can get back together. Also, my husband's father died this year, which was rough. And, I started working more for the first time in our marriage. Tough year, y'all. Good thing we're both funny as hell. I predict the real estate market will go wild and these excellent realtors I know in Columbia, South Carolina will make so much money they'll take me and my family on a tour of Europe. I predict I'll be about the same weight and look about a year older one year from now. And I'm tagging...Faith the Atomic Blonde, Lisa of Blonde Appetit and Sam of Baan Sawan Thai Bistro. I predict they might not do this thing, but I hope they do, because I think it's fairly entertaining. In other news, today is New Year's Day and, out of silly superstition and fear, I rushed to the store at the last minute and bought the ingredients for the easiest good luck meal ever. Should you ever be in the same desperate situation, please return to this post. Buy a 2 pound bag of frozen black-eyed peas. Dump half of them in a pot with 2-3 cloves chopped garlic, a can of Rotel tomatoes and about a cup of water, enough to cover the peas. Bring them to a boil, turn down the heat and let them simmer until they're tender, a little over an hour. Serve over rice. I used the ready-made frozen kind from Trader Joe's. Hell yeah. Sprinkle crispy onions from a can on top. Heat a splash of olive oil and a few spoonfuls of Miso in a pot. I bought Garlic Red Pepper Miso at Rosewood Market recently and I love it so much I want to marry it. Add a chopped onion, some soy sauce and a splash or three of vinegar. I used cider vinegar because I had it, but rice wine vinegar would be just ducky. Add an a**load of sliced collards to the pot, wilting them as you go so everything fits. The X-Man and I bought four bunches and used them all. His New Year's Resolution is to eat at least one vegetable a day, which he apparently has not been doing. Do I get that Mother of the Year Award now? Cook them until they're done and add more vinegar and/or soy to taste. Put a boneless, 2 1/2 pound pork roast in a Reynold's oven bag with 1/4 cup of something liquid. I used Shealey's Bar-B-Que Vinegar and Pepper Sauce. Make a sauce out of shallots, jelly, ketchup, vinegar and some seasoning. I added equal parts ketchup and Cherchie's Lem'n Hot Pepper Jelly to the pot, heated them and added about 1/3 cup chopped shallots. I know shallots are fancy, but they're milder than red or yellow onions and hold up better than green onions. Then I splashed in some vinegar until it tasted right. The sauce simmered for a while. I have no idea how long, so don't ask. I didn't add any seasoning, because the Lem'n Hot Pepper Jelly was interesting enough. You could use apricot, orange or apple jelly and add chili powder. Oh, wait. I lied. I used a little garlic salt. The roast will take about an hour and a half to cook - the directions come in the box of Reynold's Oven Bags, which rock. You can make the other stuff during that hour and a half. You can also drink about a half bottle of Chardonnay, which I did. Mwah! Namasté and Happy New Year, y'all! my brain is currently mush right now. But yes...I will follow your lead. Thanks for thinking of me. Happy New Year! Do i make predictions? Do I tag someone else? Should I run around, looking behind me, while shrieking and laughing? Because I do that last one now anyway, except for the laughing. I hope you put a penny in your collard greens! At least if you know the toddler will become human again around 3, that's something to look forward to, right? I also did it. since I'm not really an exclamation point kind of guy, but I don't want to feel left out of the enthusiasm: !